Simply Streisand – Hello Again, Dolly! 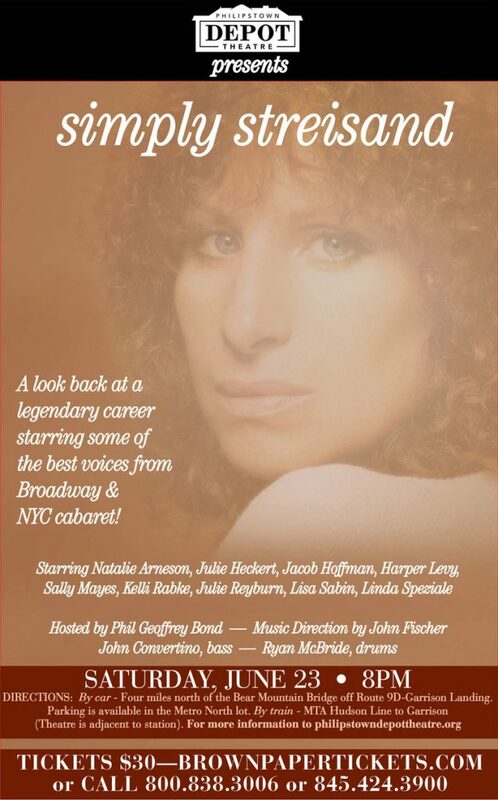 SIMPLY STREISAND is a celebration of Ms. Barbra Streisand, her legendary career and the music she made famous. At Simply Streisand, you’ll hear tunes including melodies she belted out in the small nightclubs of Greenwich Village, to her 70‘s disco-infused period, straight through to the mega ballads that have come to define her work. Starring a stellar cast of Broadway voices as well as local favorites, think People, You Don’t Bring Me Flowers, Evergreen, The Way We Were and… to coincide with this special Hello, Dolly! anniversary, a heavy dose of the music she performed in the classic film from 20th Century Fox, in which the Depot Theatre is prominently featured. The Philipstown Depot Theatre is accessible BY CAR – four miles north of the Bear Mountain Bridge off route 9D – Garrison Landing. Parking is available in the Metro North lot. BY TRAIN – MTA Hudson Line to Garrison (theatre is adjacent to station). For more information and for tickets, $30, please visit www.phillipstowndepottheatre.org or call 845.424.3900. The Philipstown Depot Theatre is sponsored by Philipstown Recreation and Philipstown Performing Arts.